Team Work Fencing is pleased to share with you the newest addition to our fencing options – aluminium slat fencing. 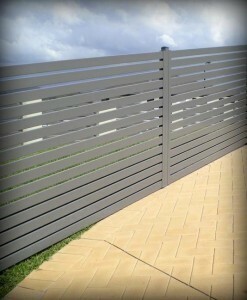 This type of fencing offers a new look, and provides incredible value to both residential and business customers. The slat fencing we offer is made of durable aluminium and is available in many different colors and finishes which enables you to choose the best for your property. Aluminium slat fencing doesn’t rot or rust, and is made right here in Australia, so you know it’s designed to tolerate the weather we have! It’s an environmentally-friendly solution because it is long-lasting, doesn’t leech any chemicals into the soil, and is made of recyclable materials. We’re exited about this new option for our customers. It’s wonderful to be able to provide so many choices and really give people the best range of products to choose from. If you’d like to find out if this new type of aluminium slat fencing is right for your property, contact us today!